I upgraded my Macbook Pro from 160GB to 250GB hard drive tonight... actually it's early in the morning. It was no easy task because I needed to remove over 24 screws and 4 of those are torq screws which required a special tool. After 45 minutes of surgery, I was up and running with my new hard drive. I now have 90GB free space. The whole process begins with getting a SATA 2.5" hard drive enclosure. I searched all over including the Internet. Most of these enclosures costs approximately $100 or more. I found one surprisingly of all places at Fry's Electronics for $19.99. Yes, $20!!! 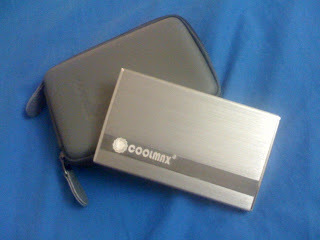 It's made by Coolmax. It comes with a carrying case and it's own little screw driver to tighten those tiny screws. You don't even have to buy a whole precision screw driver set. You can even use your tool for future use. My favorite part of this external enclosure is that it comes with it's own USB cable. When connected to a computer, it draws power from the computer via the USB. No additional AC adapter required! This really streamline the use of this hard drive enclosure without hunting for an electrical outlet. I then connected my new 250GB hard drive to my Macbook Pro by installing it into the Coolmax hard drive enclosure. I then downloaded a freeware called SuperDuper and duplicate my hard drive to the external 250GB hard drive This freeware worked flawlessly. Copying 145GB worth of data took several hours. I basically click the start copying button and went out for dinner. When I came home, it was all done. I then followed the long process of removing the screws to open the case to get into the internal guts of my Macbook Pro. It was a delicate procedure. The hardest part is keeping track of all the screws that were removed. I removed the 250GB HD from the CoolMax enclosure and replaced the 160GB HD. I then took on the arduous task of replacing all the screws and secure the Macbook Pro. When I turned on my Macbook Pro, it just kept on blipping and a quick constant LED flash. I was nervous that I might have screwed up my Macbook Pro. Most of all, I told myself "Crap! I have to remove all those screws again to get to the hard drive!!! Argh!!!" Fortunately, I stayed calm and researched on the Web with Lan's Sony VAIO laptop and Googled the symptom. It turns out that all posts on the Web points to a loose memory module. I guess I didn't seat the memory module tightly enough when I had to remove it to get to the internal hard drive. I reseated it and Voila! The computer booted right away and I heard the familiar chime. :-) My Macbook Pro now has an additional 90+GB of freespace! 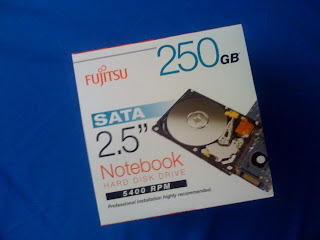 By the way, the Fujitsu hard drive is only running at 5400 rpm . It's not the fastest but it's only $99.99 at Fry's Electronics this weekend. I needed more storage space and if I needed more speed, I'll just move projects to my Mac Pro.